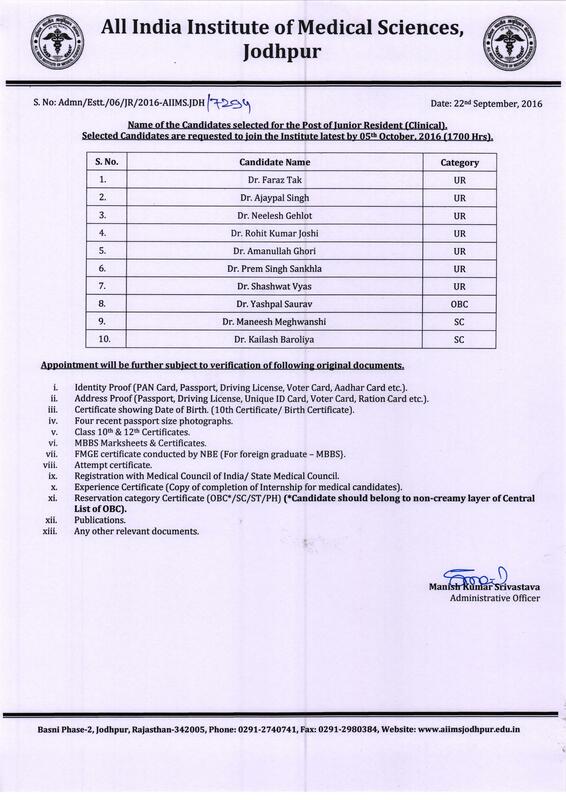 Name of the candidates selected for the post of Senior Resident. 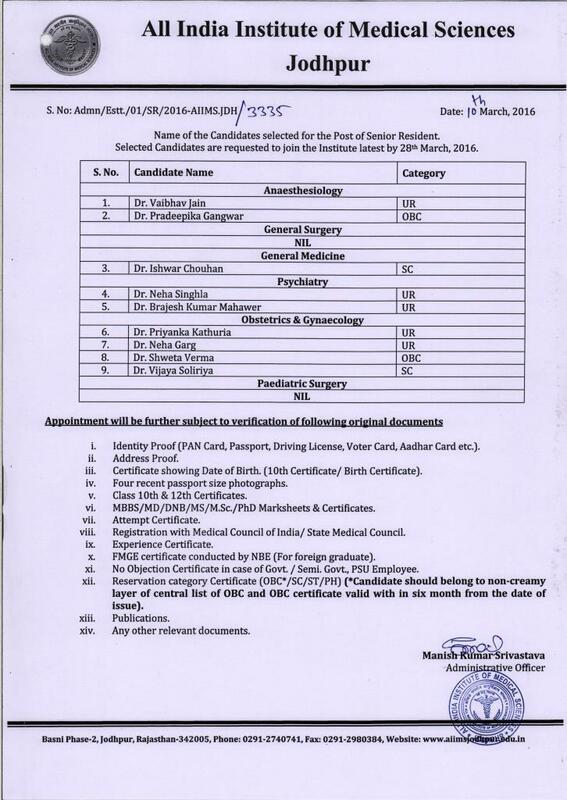 List of selected candidates for the post of Non-Academic Junior Resident (Clinical). Advertisement No. 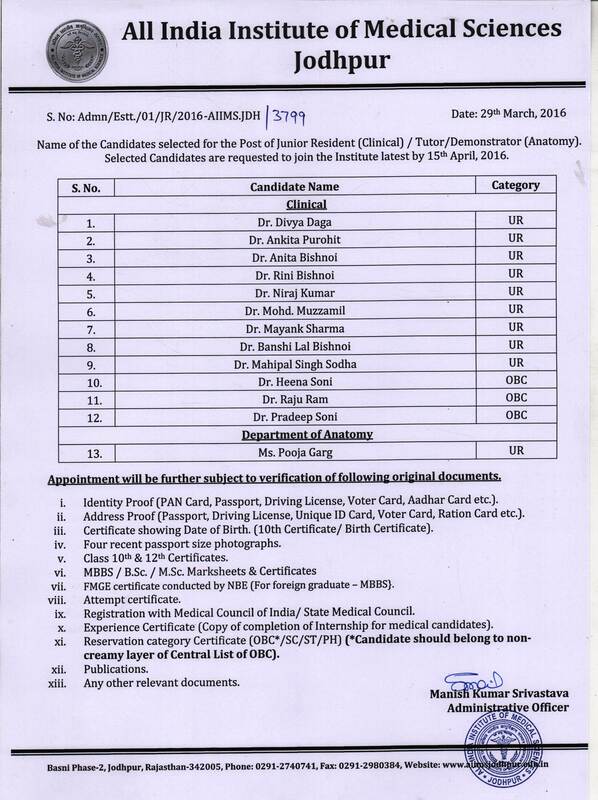 Admn/Faculty/02/2018-AIIMS.JDH The list of the selected candidates for the post of faculty in different departments at AIIMS, Jodhpur (Rajasthan). Advertisement No. 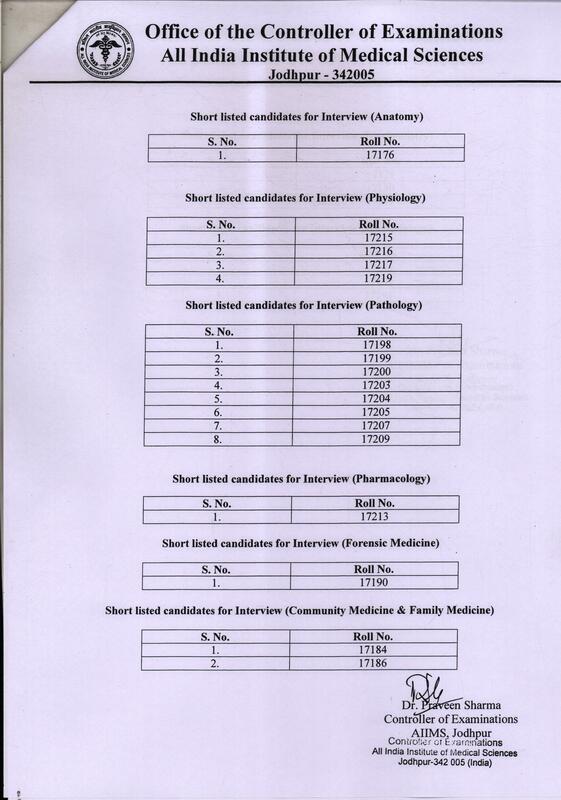 Admn/Faculty/01/2018-AIIMS.JDH The list of the selected candidates for the post of faculty in different departments at AIIMS, Jodhpur (Rajasthan). 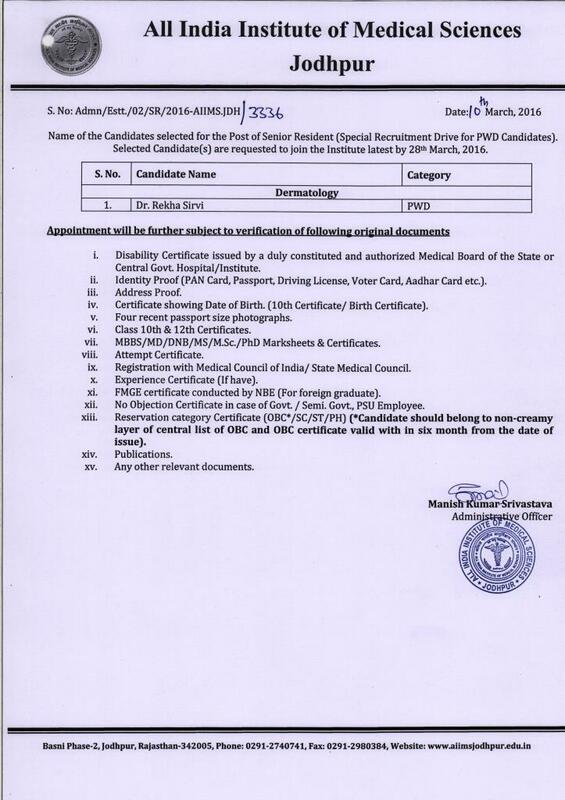 List of selected candidates for the post of Research Associate for Project Titled "System Approach for Assessment of Maternal Deaths in Rajasthan : A Feasibility Study"
List of selected candidates for the post of Senior Resident. Advertisement No. 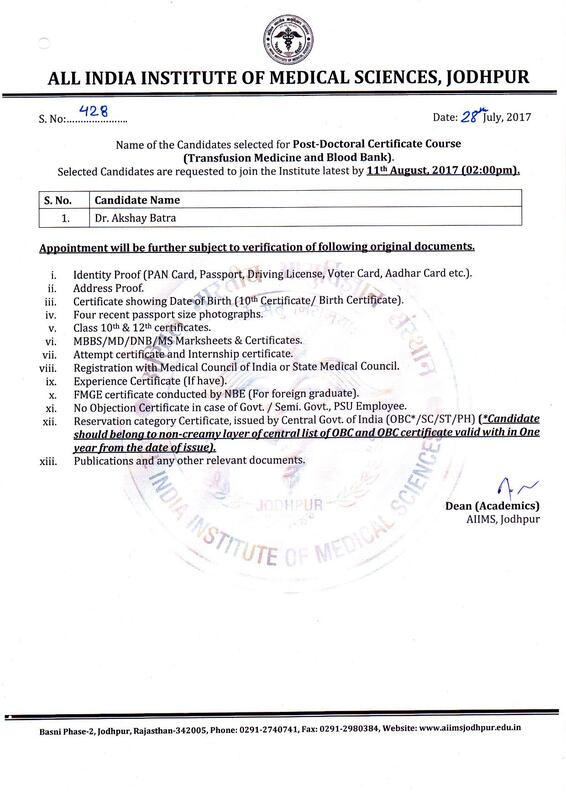 Admn/Direct_Recruitment/01/2017-AIIMS.JDH The list of the selected candidates for the post of Ante Natal Medical Officer at AIIMS, Jodhpur (Rajasthan). Advertisement No. 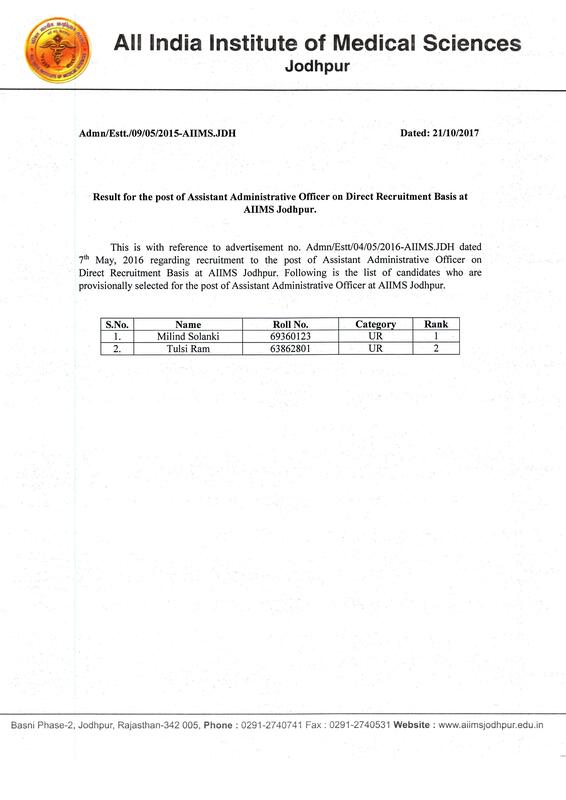 Admn/Faculty/01/2017-AIIMS.JDH and Admn/Faculty/02/2017-AIIMS.JDH The list of the selected candidates for the post of faculty in different departments at AIIMS, Jodhpur (Rajasthan). Advertisement No. 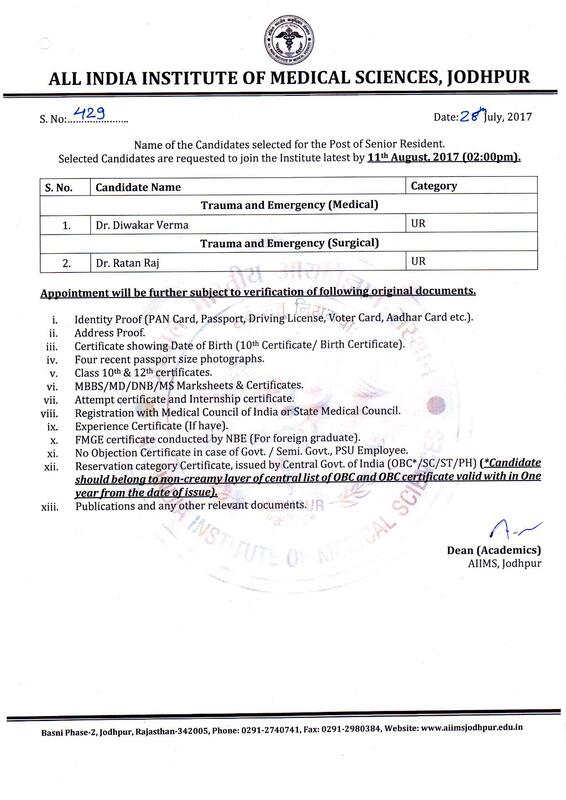 AIIMS/RES(05)/2018/288 Name of candidates selected for the Research staff for project titled “Evaluating and strengthening Pre-Hospital trauma care system for mitigating burden of road traffic accidents in Jodhpur, Rajasthan" at AIIMS, Jodhpur (Rajasthan). Advertisement No. 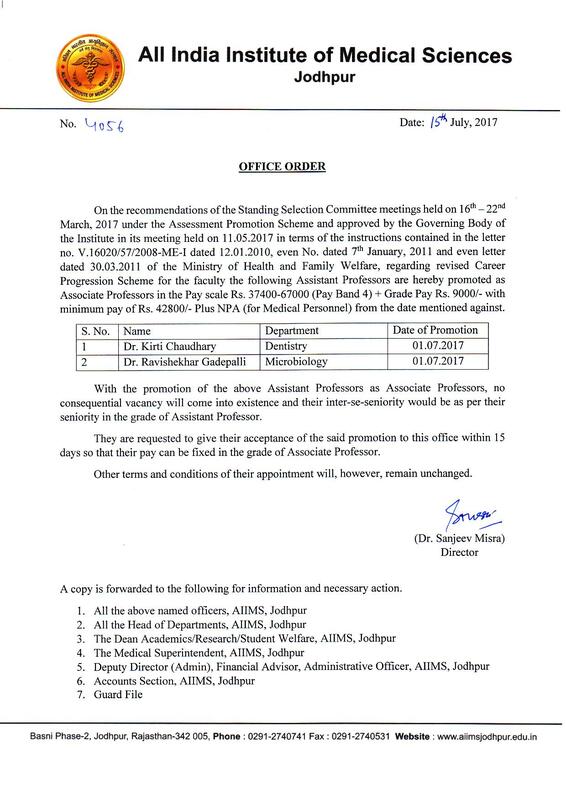 AIIMS/RES(5)/2018/286 Name of candidates selected for the Research staff for project titled “Initiating Antimicrobial Stewardship activities in hospitals in India" at AIIMS, Jodhpur (Rajasthan). Advertisement No. 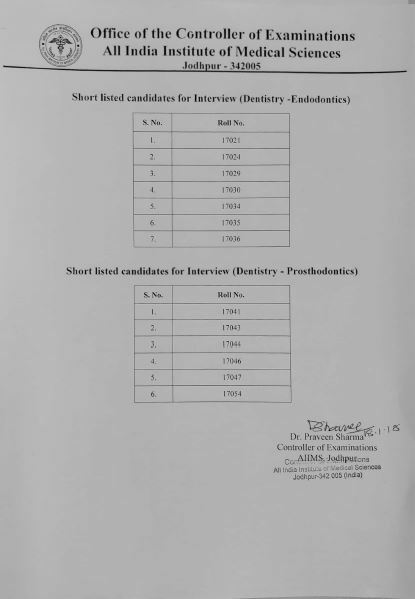 AIIMS/RES(04)/2017/176 Name of candidates selected for the Research staff for project titled "Prevalence of Fluorosis in the community of selected districts of India and development of an appropriate intervention model for prevention and control of fluorosis" at AIIMS, Jodhpur (Rajasthan). Advertisement No. 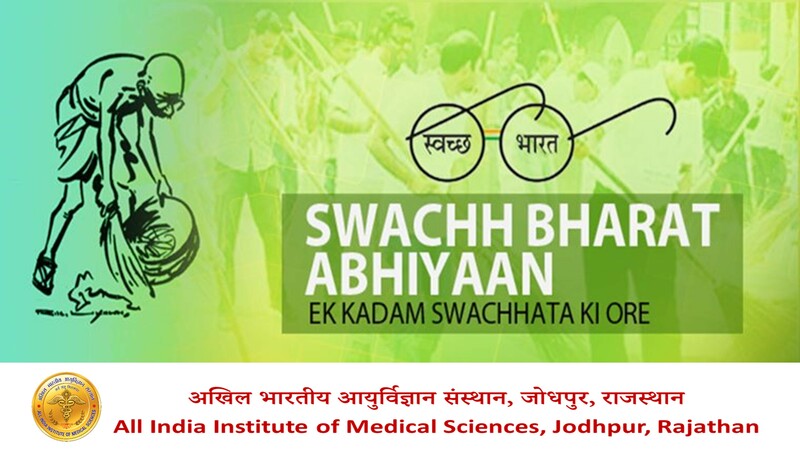 Dean (Academics)/06/SR/2018-AIIMS.JDH Name of candidates selected for the post Senior Resident at AIIMS, Jodhpur (Rajasthan). 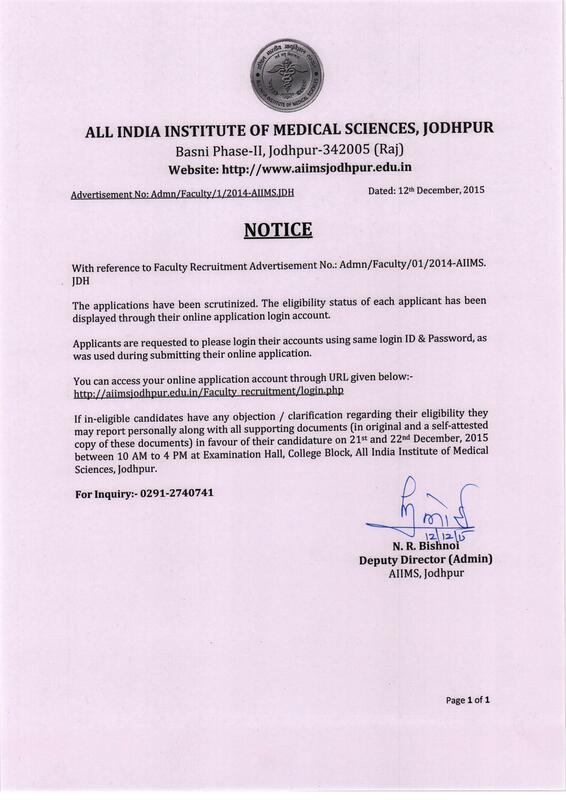 Advertisement No: Dean (Academics)/06/PDF-PDCC/2018-AIIMS.JDH Name of candidates selected for Post-Doctoral Fellowship and Certificate Courses at AIIMS, Jodhpur (Rajasthan). Name of the selected candidate for the Research Staff for project titled "To develop acute respiratory infection treatments unit (ATU) and assess their utility in improving healthcare and research in pneumonia related morbidity and mortality in India"
Name of the candidates selected for the Scientist (Medical) for project titled "Congenital Rubella Syndrome (CRS) Surveillance in India"
Name of the candidates selected for the research staff for project titled "Survey for monitoring the national Non Communicable Diseases (NCD) targets 2016-17"
RESULT NOTIFICATION NO. 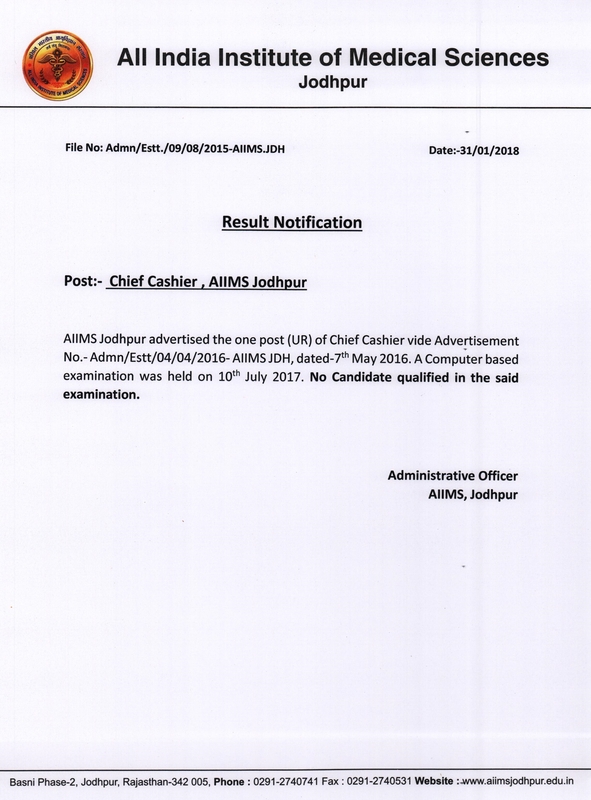 56/2017- Result for the Recruitment to the post of Staff Nurse Grade-II for AIIMS Jodhpur conducted by AIIMS, New Delhi. 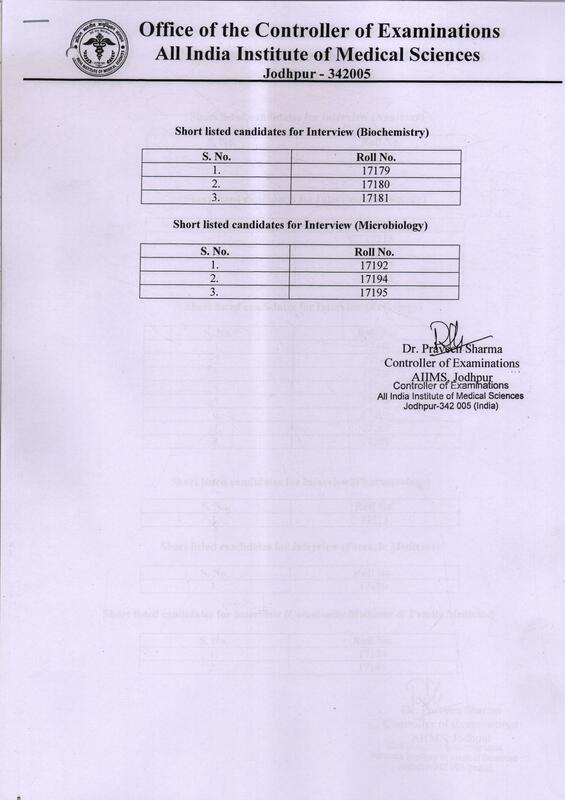 Name of the Candidates selected for the Laboratory Technician-C for project titled "The Hospital based sentinel surveillance for S. pneumoniae and other invasive bacterial disease Study"
Name of the Candidates selected for the Research Staff for project titled "Low Birth Weight in Newborn and anemia in pregnancy in Fluoride Endemic Areas of Western Rajasthan"
Name of the Candidates selected for the Research Staff for project titled "The Hospital based sentinel surveillance for S. pneumoniae and other invasive bacterial sisease study ". Name of the Candidates selected for the Research Staff for project titled "Capacity Building and Strengthening of Hospital Infection Control to Detect and Prevent Antimicrobial Resistance in India". 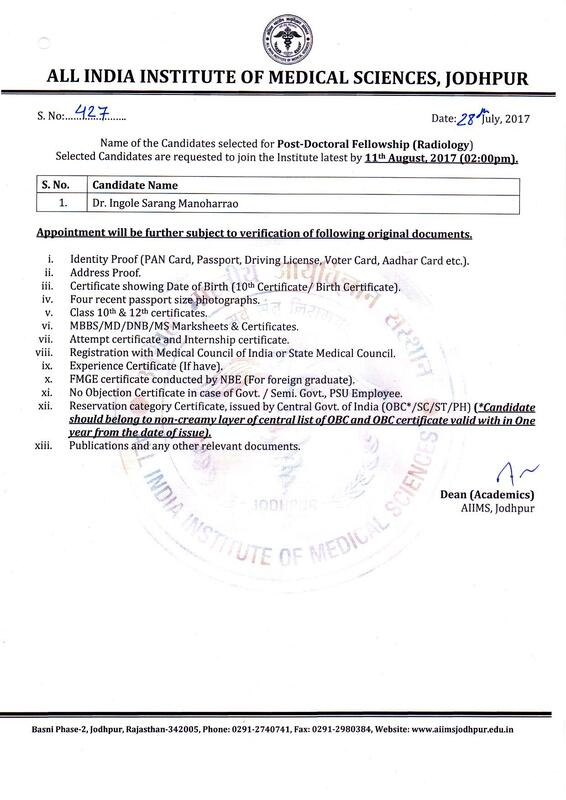 INTERVIEW NOTICE FOR FACULTY POSTS (GROUP ‘A’) IN VARIOUS SPECIALTY DEPARTMENTS AT AIIMS JODHPUR ON DIRECT RECRUITMENT BASIS. INTERVIEW NOTICE FOR FACULTY POSTS (GROUP ‘A’) IN Super SPECIALTY DEPARTMENTS AT AIIMS JODHPUR ON DIRECT RECRUITMENT BASIS. 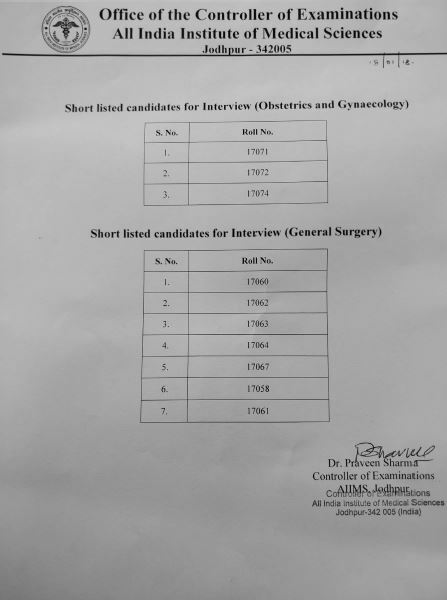 ELIGIBILITY NOTICE FOR FACULTY POSTS (GROUP ‘A’) IN VARIOUS SPECIALTY DEPARTMENTS AT AIIMS JODHPUR ON DIRECT RECRUITMENT BASIS. 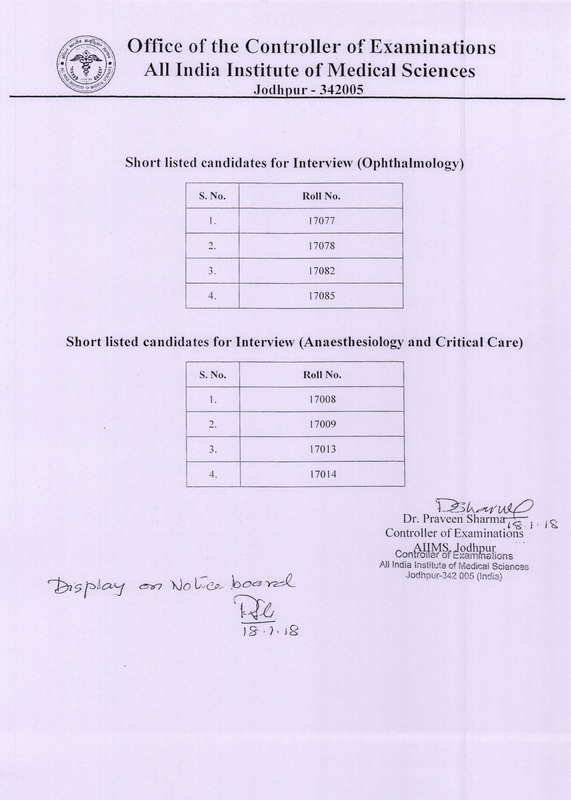 Name of the Candidates selected for the Research Staff for project titled "Perception and Practice of Physicians, Pharmacists and Patients regarding the prescription of generic drugs in Patan City"
Information Brochure / Admit Card for Selection procedure for recruitment of Assistant Engineer (Civil) & Junior Engineer (Civil) on Direct Recruitment Basis. 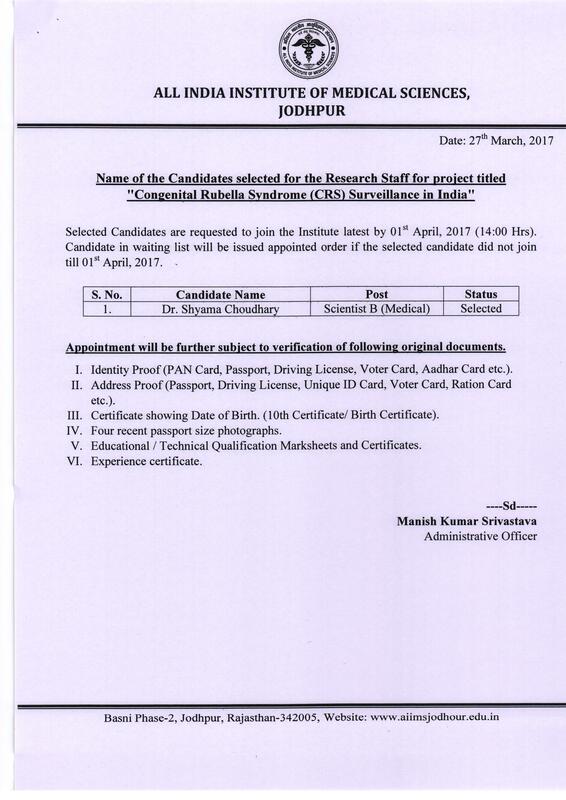 Name of the Candidates selected for the Research Staff for project titled "Congenital Rubella Syndrome Surveillance of India"
Name of the Candidates selected for the Research Staff for project titled "The Hospital based Sentinel surveillance for S. Pneumoniae and other Invasive Bacterial Disease Study"
Result of screening examination for the post of Lecturer(Nursing) held on 23rd Feb, 2016. 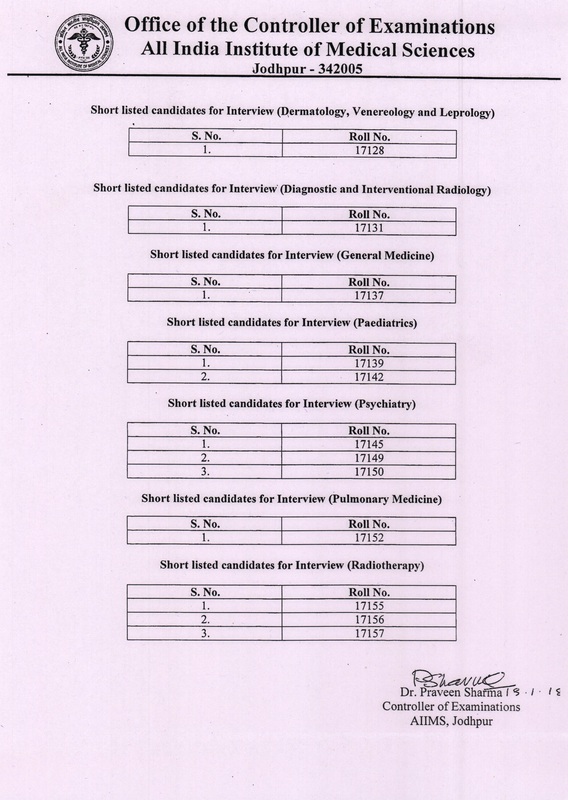 Result of screening examination for the post of Tutor/Clinical Instructor (Nursing) held on 22nd Feb, 2016.